Axew is an olive green colour, with a darker green horn on top of it’s head. There are pale green tusks coming from it’s mouth and green detailing around it’s neck. It has embroidered eye detail with red pupils. 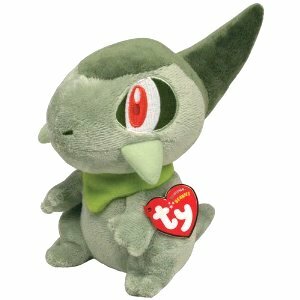 Axew was released along with five other Pokemon Beanie Babies in October 2011, the others being Pikachu, Oshawott, Pansage, Snivy and Tepig.